Thursday July 4th, km 0! Departure from Saint-Cyr l’Ecole, near Paris, at Guillaume’s parents place. Hard to believe this is really happening but here we are! Jeudi 4 juillet, km 0! Départ de Saint-Cyr l’Ecole, à côté de Paris, chez les parents de Guillaume. Difficile de réaliser que notre grande aventure commence vraiment, et pourtant c’est bien parti! 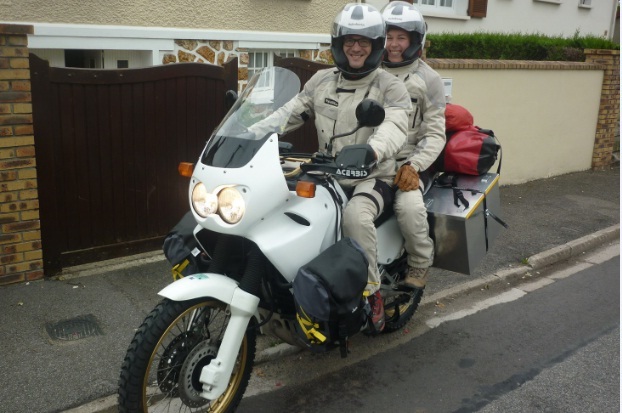 Guillaume’s dad is leaving with us on his own motorbike. 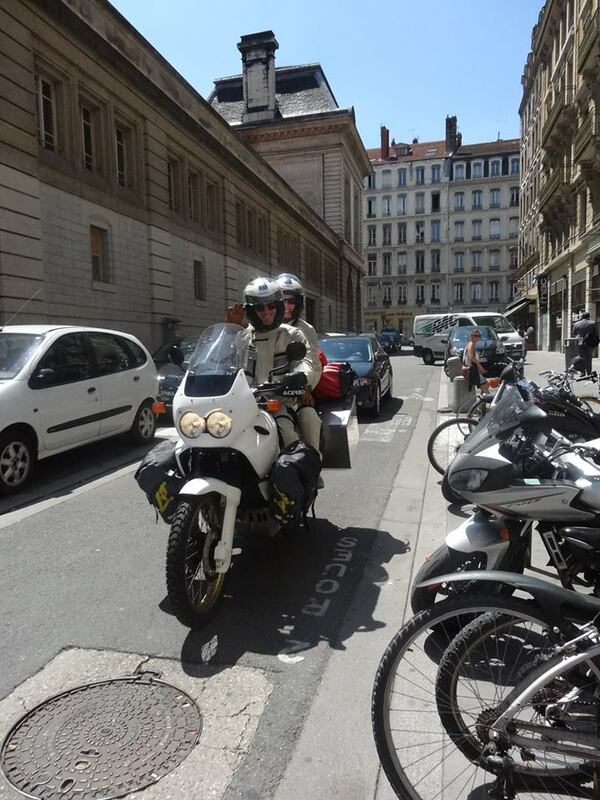 Le papa de Guillaume nous accompagne avec sa moto sur les premiers kilomètres. Since we are leaving a few days later than expected, we take the highway to go to Lyon directly. 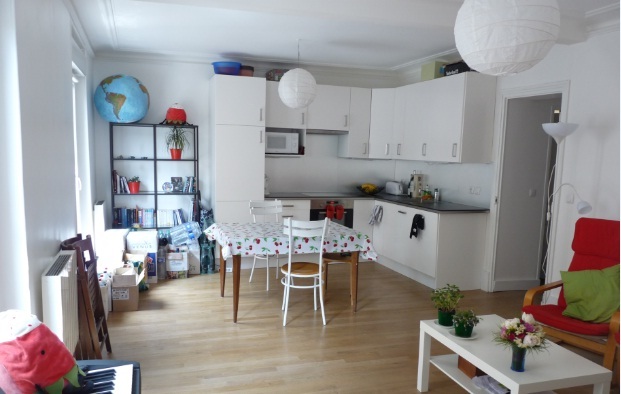 We stop at Simon and Milenda’s, they just moved in Lyon in a really nice apartment :-). Thank you guys for the nice welcome, great first night!! Comme nous avons dû retarder notre départ de quelques jours pour être prêts, on prend l’autoroute pour aller à Lyon directement. 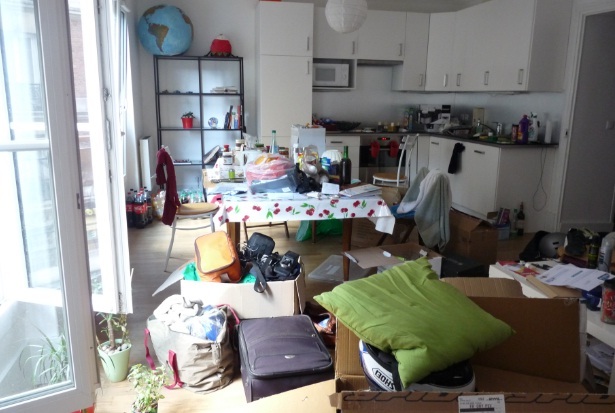 On y est accueillis par Simon et Milenda qui viennent d’emménager dans un super appart :-). Merci les amis pour votre accueil, première étape au top! 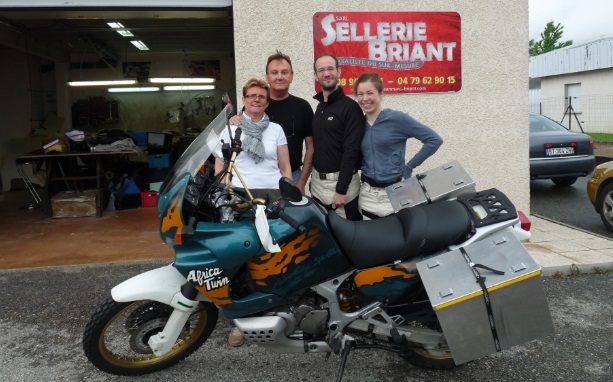 Today, we keep driving South towards the Alps : direction Embrun, where Laure’s family is expecting us. Arrival in the early evening, quick dive in the lake which feels good after a hot day on the road! 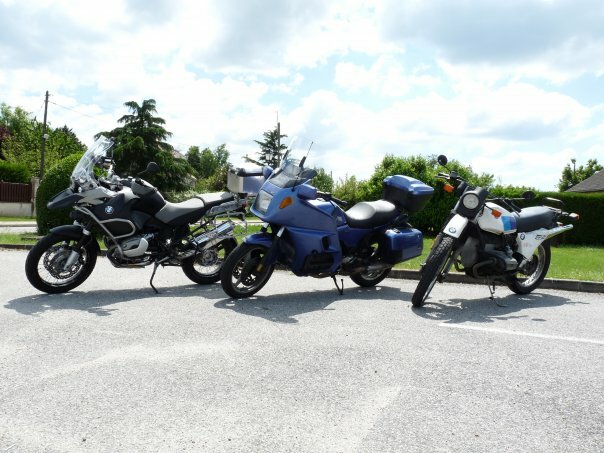 Aujourd’hui, on continue à rouler vers le Sud direction Embrun dans les Hautes-Alpes, où la famille de Laure nous attend. Arrivée en début de soirée, et petit plongeon dans le lac qui fait du bien après une journée de bonne chaleur sur la route. For our trip, comfort is very important. 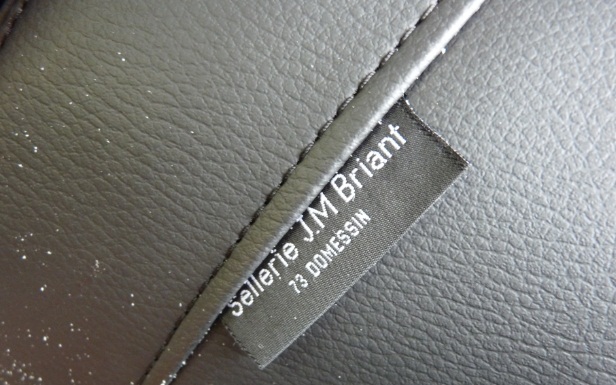 Jean-Marc Briant, a well-known French seatmaker, proposed to make for us a special seat. We went to his shop on a Saturday morning to have it prepared. Jean-Marc works on the foam while his wife cuts the leather. 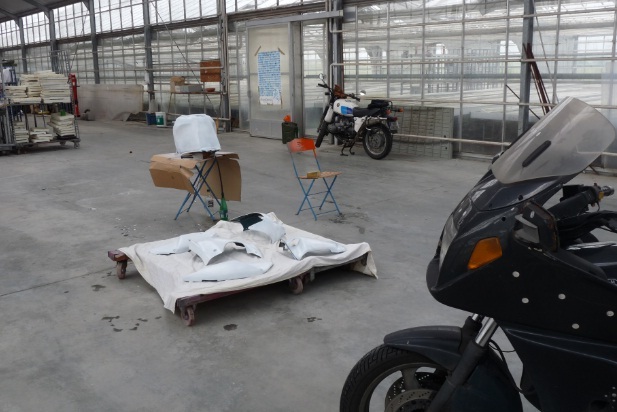 we have two layers of Bultex foam on our new seat, for hours of comfortable riding! 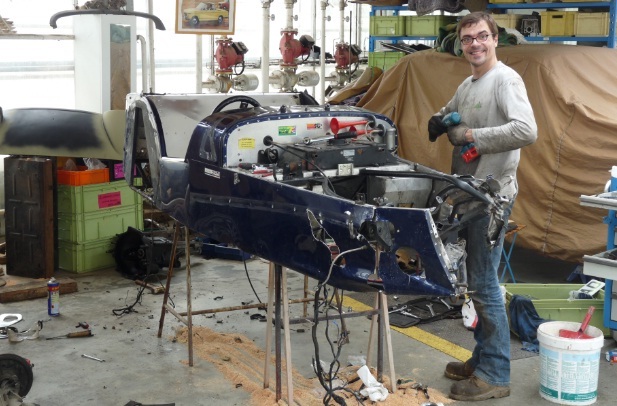 Then Jean-Marc prepares the cover. Seeing him sewing is the most impressive part, he sews really, really quickly. Once the cover set on the foam, it is done! We haven’t told here every detail of the preparation of a custom seat, but it’s a real piece of art. Go to Barby and see by yourself! 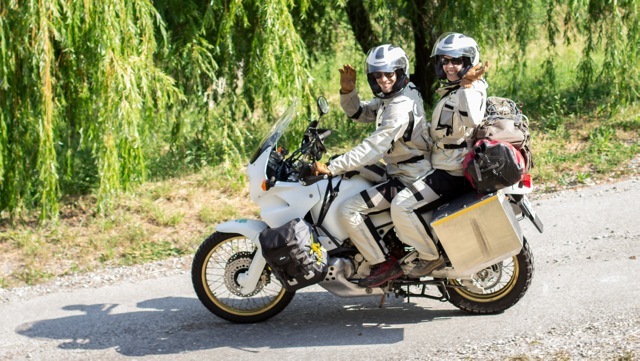 Weeeeeeell… The idea of travelling on a motorbike is an old one for me. I have always loved bikes, and riding on them as soon as I get my licence. 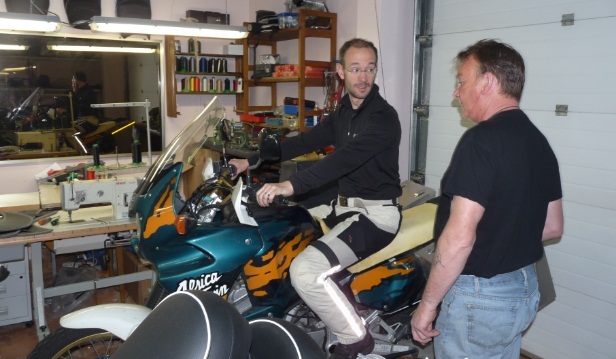 The first bikes I rode was a Derbi Senda SM, when I get my driving licence at 18 I rode my father’s, the first bike I bought myself was a BMW K1100LT. 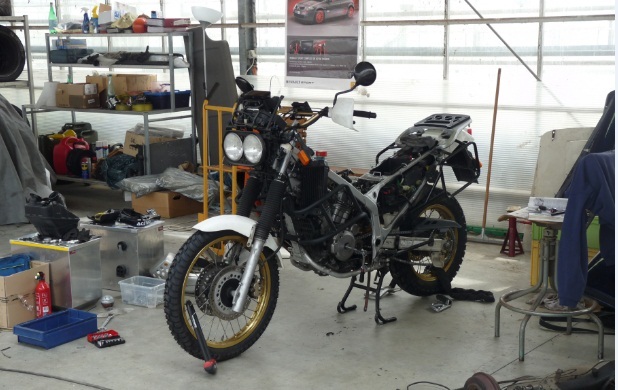 Not the prettiest bike, but I still love her, even if her gearbox and rear axle need to be changed. During spring 2008 I begin to think about going to Morocco on a bike. Sebastien’s parents (Sebastien is one of my closest friends) used to live in Rabat, so we were planning to ride from Paris to Morocco then stay a while at his parents’ then ride back. 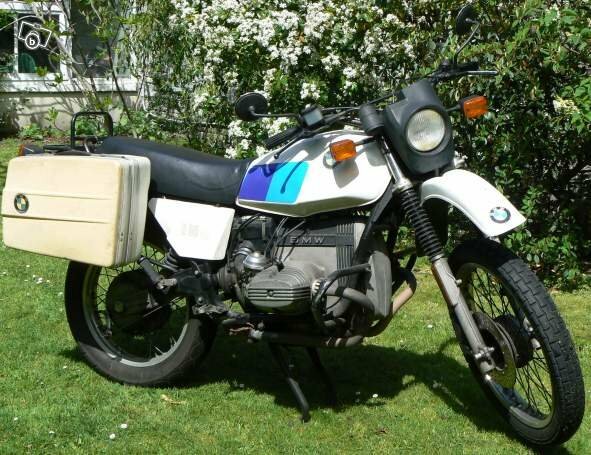 At the same time I found in the ads on internet (looking for bikes is one of my main hobbies^^) a first hand BMW R80G/S. We went to Le Havre with Laure to see her and rode her back to Paris. What a lovely bike, isn’t it? Finally I was unable to have enough holidays during summer 2008 for such a trip… so Laure and I went sailing a week in Britain. Buuuuuut… some months later, the idea of travelling to Morocco came back. Not with Sebastien (sorry, Seb…) but with Laure. 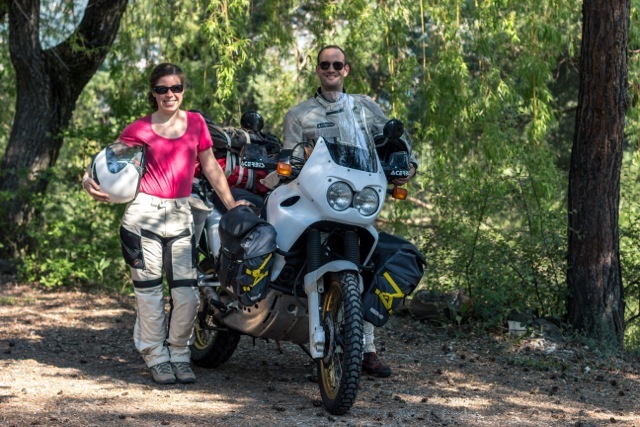 Laure’s mother was worried about us to travel on a 30 year old motorbike, so I took the opportunity (well, I also grabbed a bargain) to buy a BMW R1200GS Adventure. So we got the bike for our first motorcycle trip together!